This is our new Little Mal Puppy: Irie. 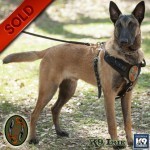 He will be trained for patrol duel purpose, trailing and detection. He is available to law enfacement and SAR. We just started his trailing training and this will not be complete until he is 10 months old. At that time we begin his detection work. Please email me if you have an interest in this super high drive map!